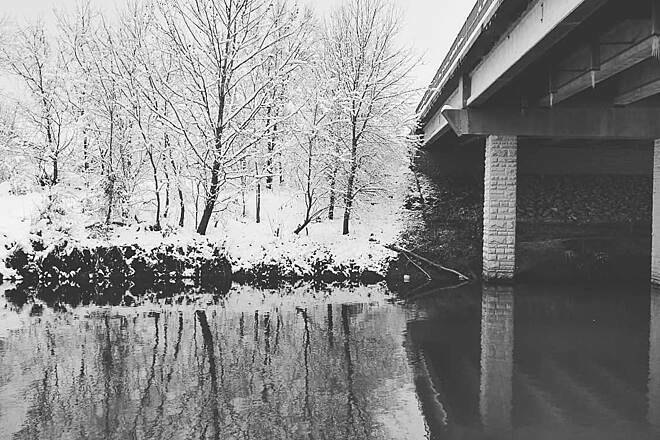 Located outside of bustling Kansas City, this beautiful, partially paved, 15-mile riverside pathway is a favorite for locals and visitors alike. 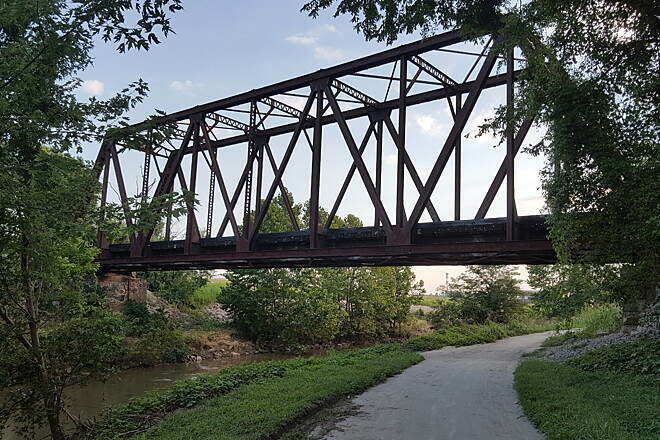 Unlike many of the rural trails that you find in Missouri, the Little Blue Trace Trail runs through several busy suburbs of Kansas City, causing the corridor itself to be relatively populated at all times of day. The southern trailhead is not marked with signage and there is no parking, just a place to pull off the road and enter through a gate. However, 3.7 miles north of the trail’s southern terminus, you’ll find parking in a bustling shopping and dining area called Hartman Heritage Center, located off S. Little Blue Parkway just north of I-70. The trail has excellent picnic and bathroom amenities all along the way, and there are several strategically placed emergency call buttons should trail users find themselves needing help. 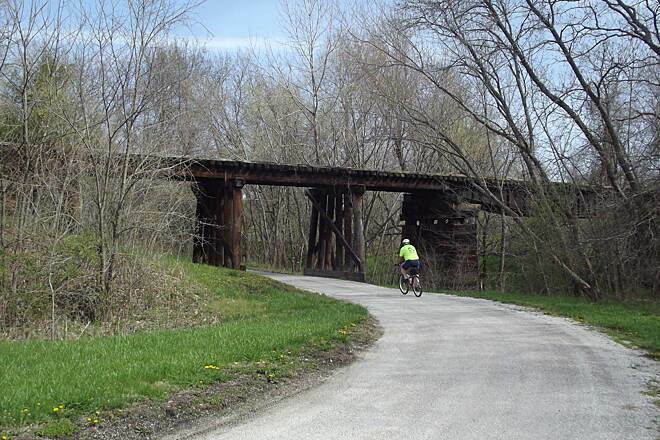 Lined with yellow wildflowers in the summer, the trail passes under several old train trestles and more modern overpasses. 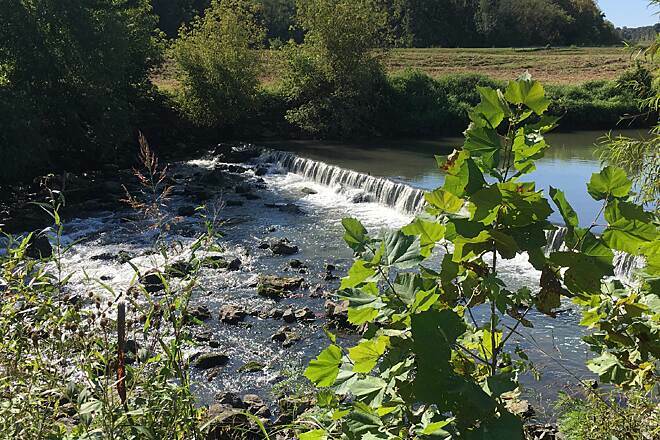 At mile marker 7, be sure to stop for a picture at a small waterfall. Here you may even catch a glimpse of a pair of resident snapping turtles. Also of note, several well-marked parking accesses dot the second half of the trail, making it very easy to begin your trip at a variety of points along the way. Take caution because a couple of times on the trail you will have to make a steep climb up to a main road where you take a brief off-road paved path to return to the trail via a fairly steep drop-off with turns. The trail is plenty wide and nicely paved and maintained in each of these instances, but it is still important to be careful of your speed. The trail ends in a nice park with parking. 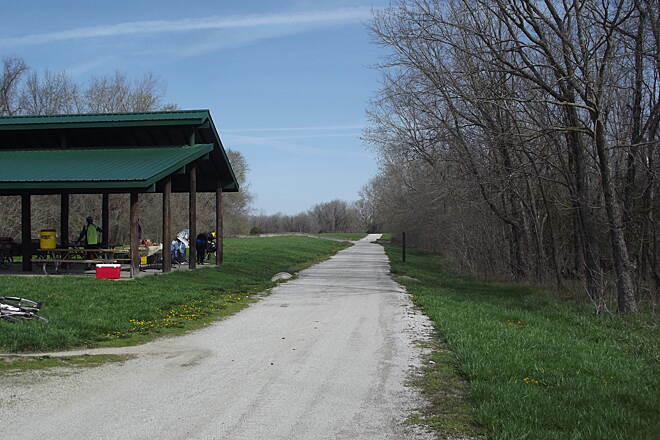 The closest parking lot to the southern end of the trail is in Hartman Heritage Center, a shopping and dining area. From I-70, take Exit 17 for Little Blue Pkwy. Head north on the parkway; shortly thereafter, you will come to E. Jackson Drive. Take a left onto E. Jackson Drive to enter the commercial area. On E. Jackson Drive, take your first right turn into a parking lot; toward the back of this lot, you’ll see a playground, portable toilet, and the trail access point. 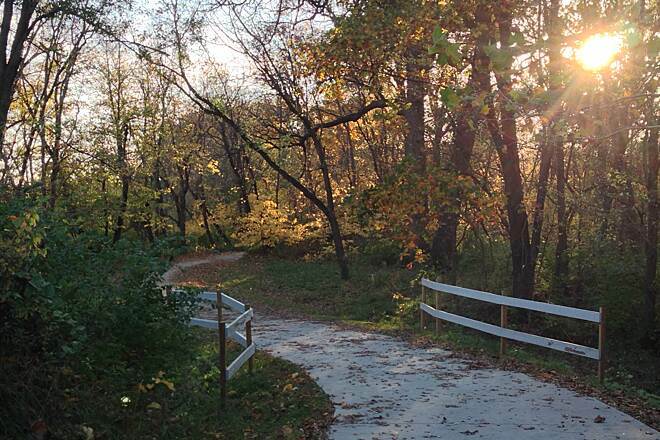 To reach the southern trailhead, travel 3.7 miles southwest along the trail to Phelps Road at NW Lee’s Summit Road. To reach the northern trailhead from Independence, travel eastbound on US 24 until you see the exit for N. Twyman Road. Take a left and stay on N. Twyman Road for 1.1 miles. Turn left onto E. Blue Mills Road and continue on the roadway for 0.9 mile. Take a left onto E. Old Blue Mills Road and the trailhead will appear immediately on your left. This trail has been extended 1.7 miles south from end of trail shownon the map. The entire trail is a great ride. Do not ride this trail shortly after rain, it's like riding through wet sand. It's also pretty bumpy at points. It does have some cool scenery though; I may ride it again when it's dry. Completed trail in about 5hrs going and coming back. Very nice scenery definitely going back when the plants and leaves are fully grown. It doesn't get any better!! Beautiful ride! 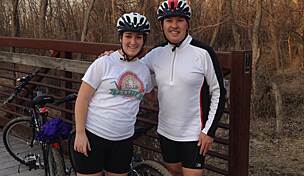 My two daughters (ages 9 and 11) are getting in shape to ride the entire Katy trail in one week this summer. 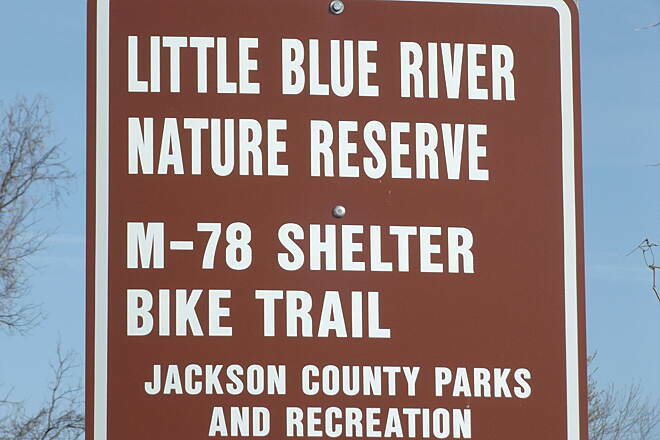 Last Sunday, 4/17/2016, we rode approximately 11 miles on the Little Blue Trace Trail. We started at the north end of the trails off Old Blue Mills road and ended at the QT on Little Blue Parkway, just past 39th Street. The trail is mostly crushed limestone and mostly level which are the same conditions we expect on the Katy. The trail was in better condition than when I rode it last fall. There were no ruts from use during wet weather and no grass growing in the middle of the trail. 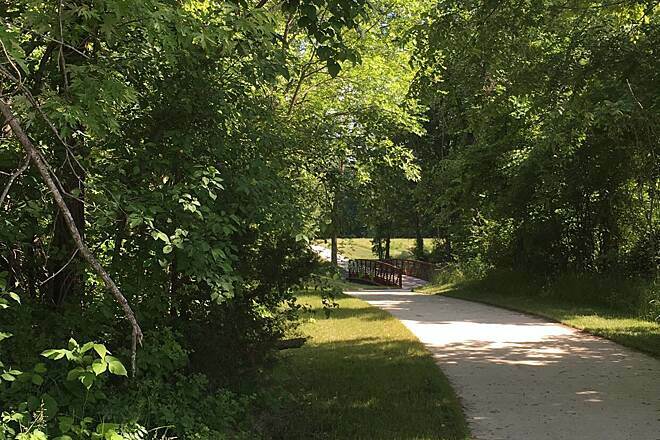 We really enjoy this trail because of the peacefulness and surrounding nature. We'll be back many times. Totally enjoyed this trail. Well marked, easy ride and can get a good distance ride in if you want. Love the Little Blue Trace Trail! I loved riding this trail yesterday. 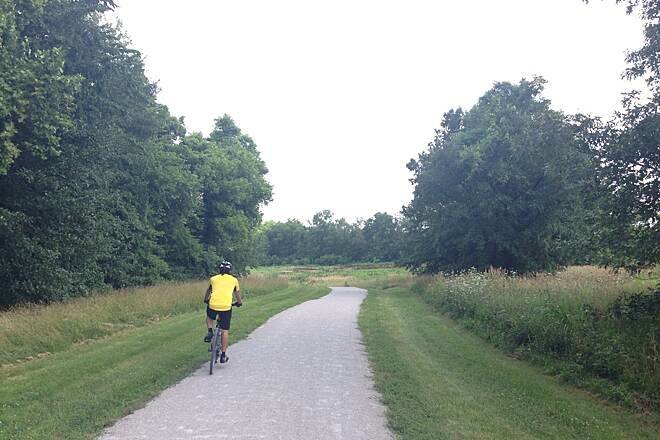 I rode about 8 miles of it and it is one of the nicest trails in the KC area. I started at the southern end and yes there is some construction that made jumping on from there difficult. But once I got on I fell in love. The surface was nice alternating between hard pack gravel and occasional sections of concrete. It was a very clean trail. I did not notice any trash or debris from limbs, etc. Now that I've ridden it I have a better idea where to park so that I don't have to deal with the construction site on the south end. I hope to ride this trail again soon and go from end to end! I have been riding the trail regularly over the past 5 years. Some improvements have been made but I feel the overall trail condition has slowly deteriorated. Don't get me wrong that the trail is still good but needs some work in helping the drainage and it won't be too long when it needs to be resurfaced. There are some real rough spots around 24 Highway. Will be nice to see the trail expand further north and south. I ride this trail frequently and it’s a great ride. 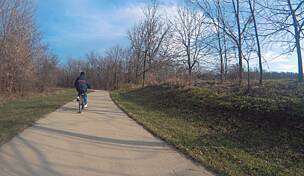 The trail is well maintained and I’ve never experienced any problems with those that walk or ride the trail. 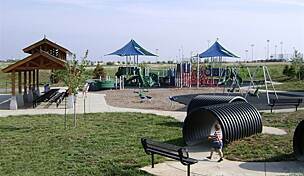 We parked near Coldstone Creamery and took a small group of kiddos bicycling on this trail. It was perfect for a short ride with kids. The trial is smooth, flat and wide at this location and there is a very small park they can play on before/after the ride. The kids enjoyed seeing the creek and going under the bridges. We didn't take a long ride, but it was perfect since we had children ranging from age 2 - 10. The only downside was that there was very little shade along this stretch of trail, so with the sun and concrete trail, it was pretty hot. We were careful not to bring/leave anything of value in our vehicle as we have read about cars being broken into at the Little Blue trailhead parking lots. I ride this entire trail, back and forth, at least once a week and never get tired of it. It's not a difficult trail, and offers a variety of scenery! I rode this trail for the first time yesterday. I got on off of Little Blue Parkway, behind the glut of strip malls, which was actually convenient, since there were plenty of places to eat right off the trail. The southern portion of the trail from there was kind of disappointing. There were always highways and houses (and one sketchy trailer park, at that) visible from the trail and I got all of 4 miles before running into a TRAIL CLOSED construction barricade and had to turn around. Not exactly the "outdoorsy" experience I was looking for, not that I could ride the entire length anyway. That said, the northern section of the trail was outstanding. This part did lead far enough out of the urban sprawl to lend a feeling of being out in the country more. The path winded enough to be interesting, had a few pretty bridges, wasn't terribly hilly and only had one road crossing to worry about. That said, overall, I enjoyed this trail and would definitely ride it again, though the southern section would be purely for mileage (8, to be exact) more than enjoyment. Hoping to return once the construction is over, and may update with a more glowing report if there is something nicer beyond that. One more note to those who are going to ride this for the first time: This trail has relatively little tree cover/shade, so if you're going to ride it in the summer, bring plenty of water and sunscreen. Worth it! Clean, nicely kept. Emergency stations. Easy to ride. It was a lot of fun!! Great ride and great trail! Peaceful and enjoyable. It is YOUR fault if you leave valuables in your vehicles! Not very smart. Just bring your license and leave your wallet at home or take it with you. rode this trail on 10/20 for the first time and loved it! 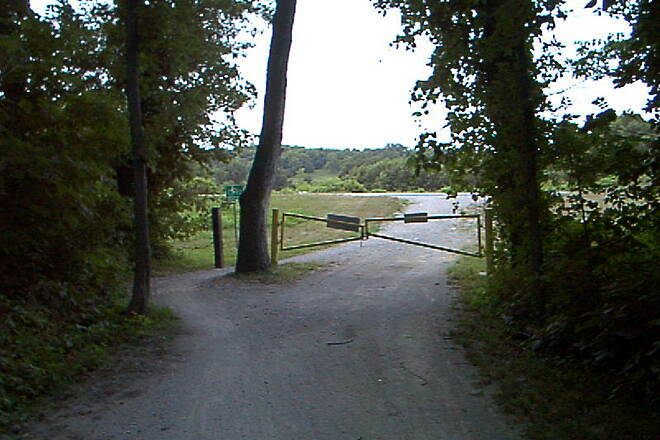 i started at the access off Lee's Summit road north of Colbern Rd right after you go over the river - it's on the right. rode from MM15 to MM7 and back. loved the variety of terrain, bridges, etc. 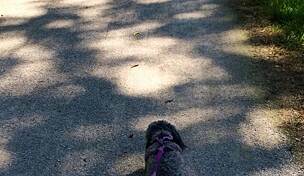 the trail was a mix of concrete sections and finely crushed stone. several places to sit if you need to--- just really enjoyed it. 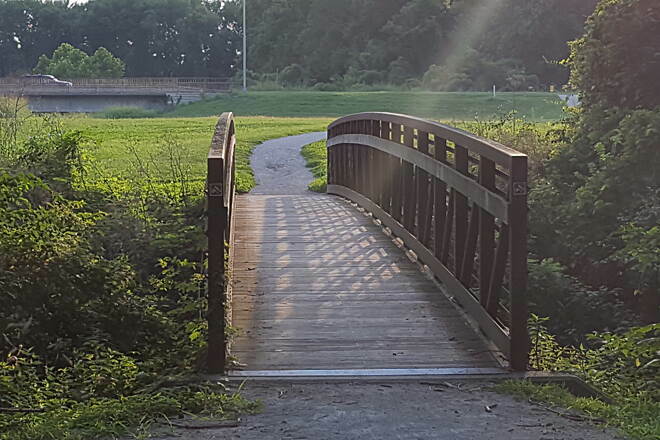 Nice long trail and good for using bike to run errands...places you can stop along the way including grocery, etc. The trail is longer than what shows on the map right now...it extends east to Lee's Summit Road. 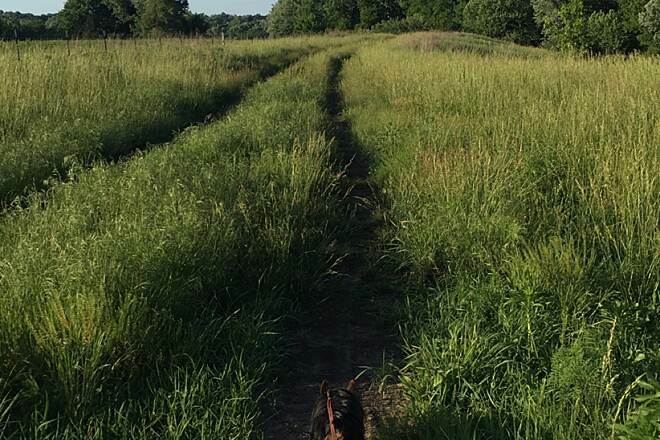 With the old-growth trees along the path and the Little Blue River to your side, the Little Blue Trace Trail is an excellent late afternoon/evening ride in the summer. Excellent shade and plenty of trail heads allow you to vary the length of your ride. Just rode the LBT and found it beautiful with the velvet green of the grasses, bright yellow of the wild mustard and the purples of the wild phlox. The trail is paved the whole length so a recumbant will be easy to ride. I hope they keep going south at the south. I rode across a field thinking the trail continued but it turned into a mud pit. Just wondering, is this trail suitable for a recumbent trike? 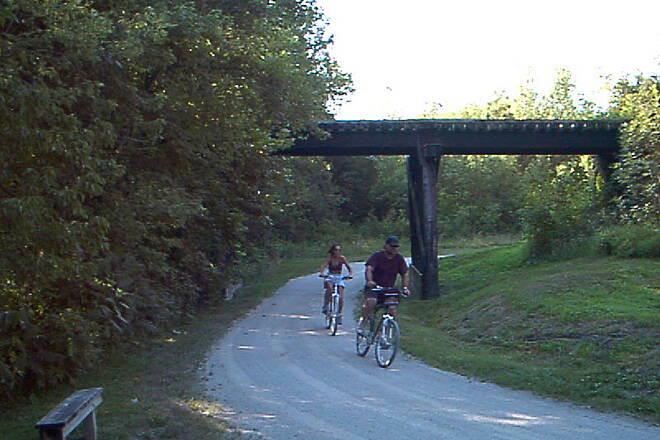 I live in the STL area and I am somewhat spoiled by all of the paved / concrete bike paths in the area. Just wondering what to expect. LBT is one of the best trails I have ever used. I have been using it for trainning for marathons for the past 10 years and it only seems to get better with time. Now, almost 15 miles in length, the LBT connects Lee's Summit road with Blue Mills Road at the north end. 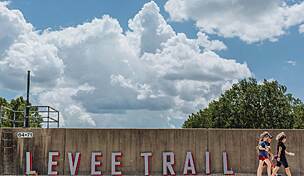 Hopefully this trail is continued someday to connect with the far southern portion by Longview lake to creat a unquie trail system. I've been riding this for several years. It's actually about 15 miles from end to end now. Near 1-70 to 40 Hwy, the trail runs in behind the shopping corridor there. My wife and I usually start at Blue Mills Rd. and enjoy stopping around half way for breakfast at McDonald's or QT at 40 Hwy. As far as theft goes, I would avoid parking your car at the 78 Hwy entrance. That seems to be where theft mainly goes down. 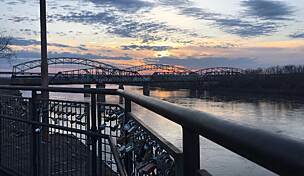 In the future, I'd love to see this get extended to the north to the Little Blue Trace park on the Missouri River. I found the trail to be very well maintained, scenic and a comfortable, easy ride. Rode from the northern most shelter to the end and back. Would be nice to end at a lake to just jump in but no compliants. Just wondering why the map doesn't show continuation south of I-70 -- I really would appreciate having mile markers at least shown on the map. The only reason I am giving this a 4 and not a 5 star is because of the upkeep. I actually don't mean that in bad way only because I know how budgets work and time and manpower are at a premium these days. This trail is not and has never been there for the "rugged" mountain biker. 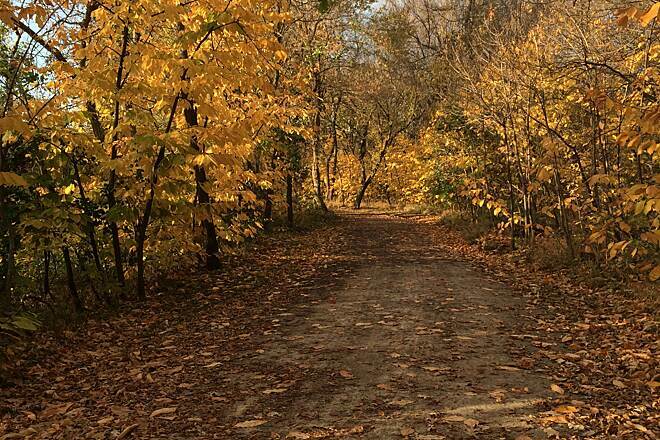 It is simply a nice trail to ride or walk and enjoy the outdoors. I have riden this trail for at least 17 years and it just keeps getting longer and I love it. I have also riden it in many conditions. On a night with the full moon and a cateye headlamp, the ride is particularly great. I would recommend this trail to anyone. The trail is great only problem is, there isn't enough restrooms or no place to get water to drink if you run out When are they going to get a new map that shows the added trail to the south It would be nice if they could post a map at interval on the trail. JACKSON COUNTY, Mo. - An active duty Fort Riley soldier who told deputies he was robbed and shot on a Jackson County trail in early August was charged Thursday with filing a false police report. Pvt. Brian Anderson, 25, was arrested Thursday without incident. He has been charged with one count of filing a false police report regarding the alleged shooting and robbery he reported. Anderson told deputies he was shot on Aug. 8 while jogging on Little Blue Trace Trail, near Independence. According to deputies, Anderson said a man came up to him and demanded his backpack, and then later shot him in the ankle. After Anderson was released from the hospital, he was questioned again by investigators. Anderson recanted his original story about being shot and robbed on the trail and admitted the wound was self-inflicted, according to Sgt. Ronda Montgomery with the Jackson County Sheriff’s Office. Anderson was transported to Fort Riley and turned over to military authorities. BEWARE - thieves watch the parking lots and break into cars!!! I LOVE this trail! I went running twice there in May 2011, and parked off of M78. But my 2nd visit ended in sadness. I returned to the parking lot after my 2 hour run to find my car passenger side window broken out and my wallet stolen from it's hiding place in my car. 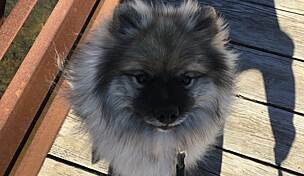 I immediately cancelled all my credit cards and ATM cards, but found that 15+ fraudulent charges had already been made, starting from within 30 minutes of leaving my car for my run on the trail. When I reported the break-in and theft that evening to the Jackson County Sheriff's Office at Fleming Park, it was clear that I wasn't the first to have this happen. 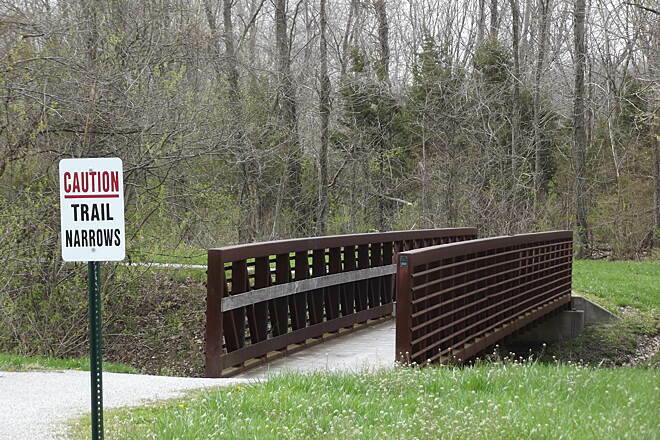 I also heard on the news this week that a runner on this trail was recently jumped and robbed. 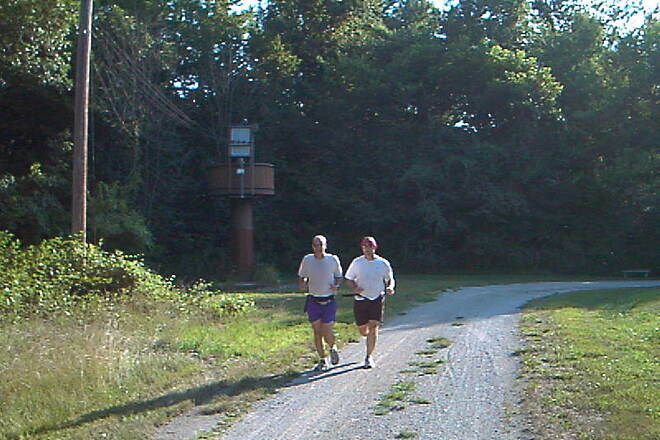 I may run this trail again sometime, but I won't use the parking lots and I won't be running alone. I hope this gets posted and hope that this helps anyone else avoid the nightmare that I've had! Identity and credit card theft is awful!!! As it turns out, I picked the hottest day of the year (108 degree high) to ride the trail from end to end - north to south. I rode mid-morning so it was in the 90's. The trail had enough shaded areas to provide breaks from the sun. There are periodic benches to provide seating for rest if needed. I didn't see any drinking water along the trail but I had taken enough for the ride. Keep this in mind. I really enjoyed the trail. The surface was very consistent and easy to manage on my hybrid with 700X32 road tires. It has been very dry so I can't attest to conditions when wet. The vast majority of the time one is cruising through the countryside with no real signs of urban life. 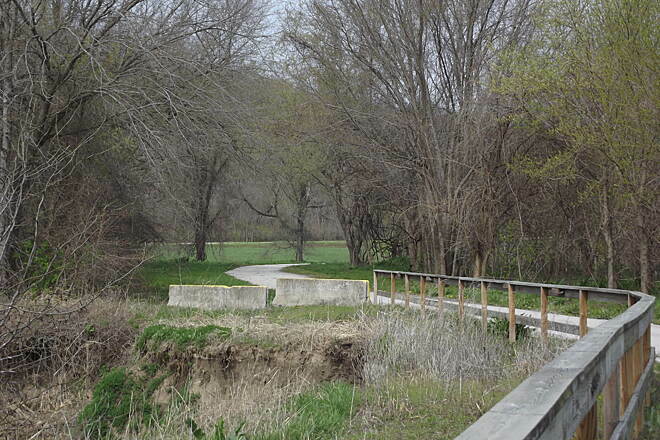 There is a nice mix of prairie and wooded areas with the small river meandering nearby. One does not ride next to the river often, though. One does go right by some shopping and under Interstate 70 near where the trail-head was prior to the new four mile southern addition. The new four miles were great. The surface was the same and as good as the old portion of the trail. One would never know this was a new addition. The only reason I deducted a star is due to the need for some direction when riding north to south. A few strategically placed "trail this way" arrow signs were needed. At a couple of the parking areas the trail rode into the parking lot with no real indication of where to go next. 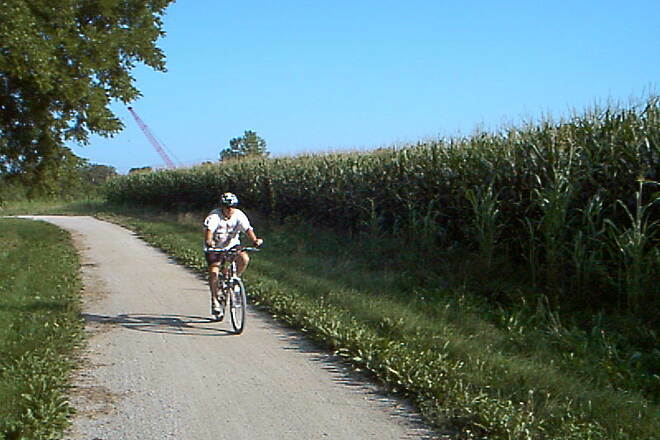 In fact, twice I ended up riding down gravel roads thinking I was following the trail. It wasn't real obvious after emerging from a under couple bridges either. Also, the crossing of M78 is not well marked and one does have to ride down the highway a short distance. 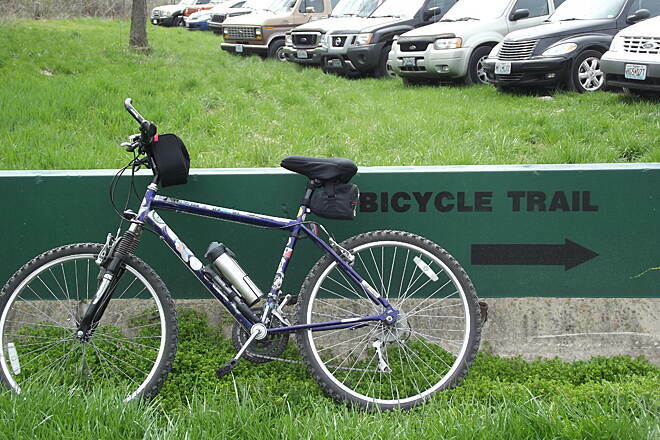 In addition, there is no parking at the current southern trail-head near Lee's Summit & Phelps. The above shortcomings mostly only apply to the first time rider. I'm really looking forward to my next visit. I'll be more familiar with the trail and it will definitely be cooler. My plan is to ride its full length both ways. I would encourage everyone to visit this little gem. I'm one of the score or more of regulars who frequently bicycle on the Trace. I've logged over 3,000 miles on it over the past three years. 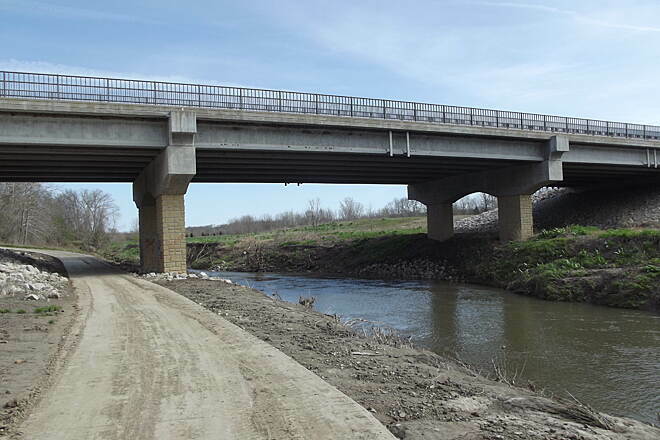 The extension southward from the I-70 bridge to Lee's Summit Road at Phelps Road is complete--sort of. There was an official opening ceremony of the extension in June, but as recently as this week the county has had the contractor back out there paving some areas that were badly rutted by recent rains. 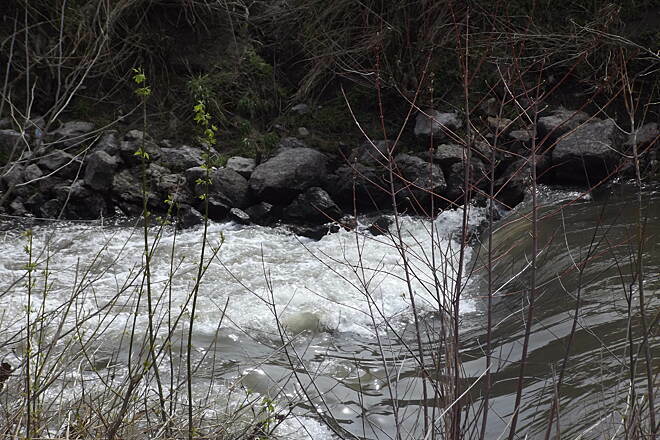 This has created some temporary blockages of the trail. The trail extension passes alongside and through several commercial areas--including the McDonald's at 40 Highway if you need refreshment. It also passes almost literally through the backyards of some residential areas. 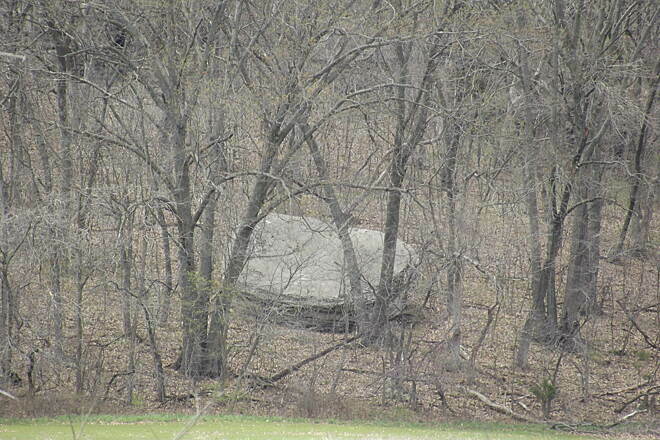 It alternates between concrete and gravel, though the gravel in the wooded areas seems more like hard packed dirt. The extension has shaper curves and more undulations than the original trail, so I advise cyclists to take it easy until they get used to the route. There has been some disagreement over exactly how long the Trace really is. 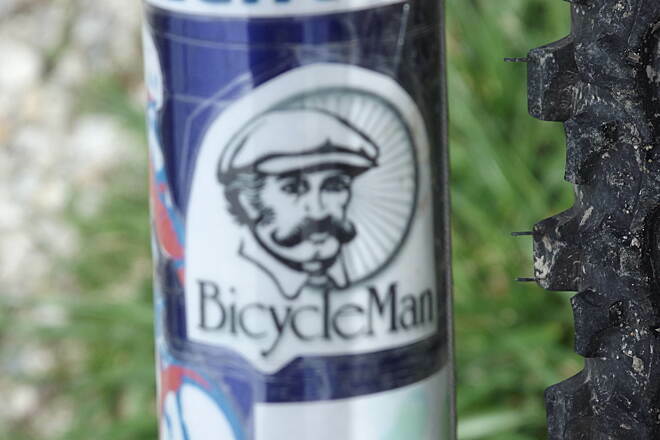 The original mile markers were set with a bicycle odometer. The county says that they were too close together and this spring new mile posts were put in place. But the location of the new mile posts were determined by a measuring wheel. That works fine on a paved surface, but a measuring wheel is not accurate on a coarse surface--it skips on gravel--and tends to measure long. (Having worked as a surveyor, I speak from experience.) Most of the cyclists I've talked to seem to feel that the original mile markers were more accurate since they represent the way a bicycle actually would traverse the trail. With that in mind, the total one-way distance from one extreme end of the trail to the other is probably right at 15 miles. Their are several more park benches and picnic tables along the way as of this year. Also, park maintenance has been resurfacing some of the problem areas with a finer, more compact, gravel mixture. Still, ruts are always a problem in places after a heavy rain. Another hazard to watch out for are the lips that form on either end of the several concrete pads--where the gravel ends and the concrete begins. Even a one-inch lip can bend a bike wheel or break a spoke. Again, I speak from experience here. And I've seen cyclists fall after riding over those lips. A couple of these bad spots also exist at footbridge abutments. The Trace can get congested on weekends. 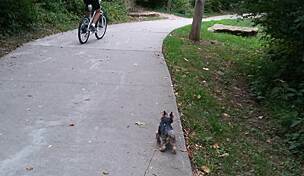 A combination of bikers, joggers, walkers, baby strollers, and dogs on, and not on, leashes--all moving at different speeds and in opposite directions--can make for a few exciting near misses. Generally, the Trace is less congested north of M-78. All in all the Trace is in better shape this year than in any of the past several years. Just remember to keep to the right, and if you are part of a group please don't take up the entire width of the trail. And for gosh sakes, leave the headphones and ear buds at home and enjoy the sounds of nature! 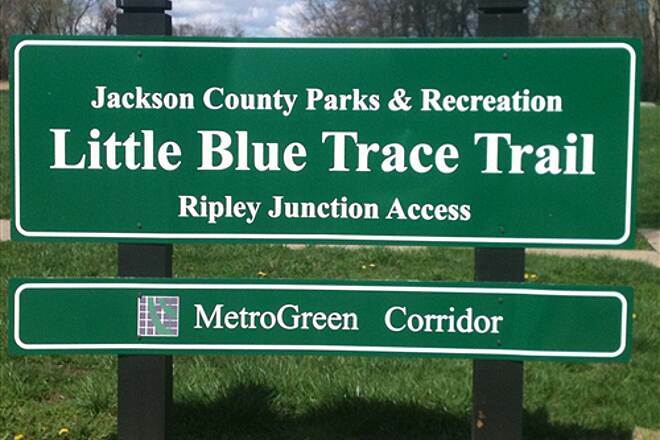 The Little Blue Trace trail is being extended to the entire length of the Little Blue Trace Park. Trailbed is in place, adjacent grass will be added in the spring I would assume. 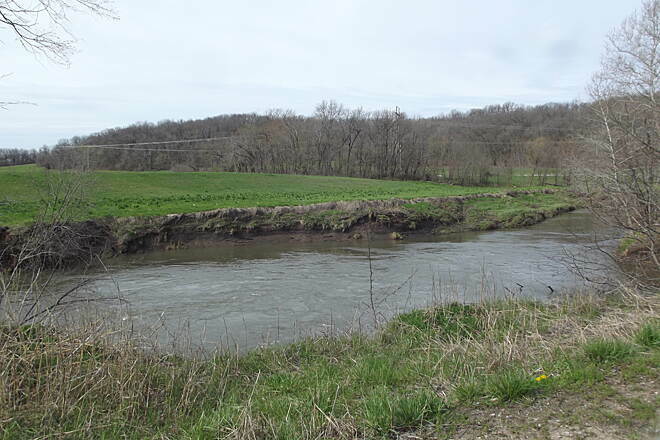 It will continue to follow the Little Blue River to the south and west to Lees Summit Road. That adds another 4 miles for a total of 14 miles (one-way). Trail is crushed gravel, mainly flat (except the two northern-most miles, there is a paved section between 39th Street and I-470. Note the map was outdated at the time of this posting, but extends now inside the entire green tinted area. 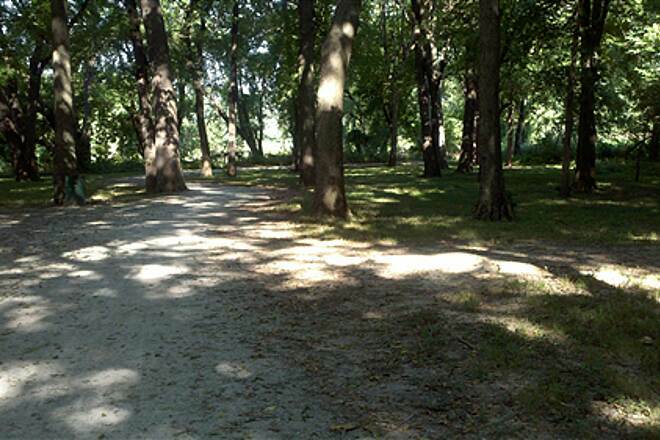 For an urban trail, it is peaceful and somwehat isolated, but used by many. The latter extension meanders unimpeded near commercial and residential areas, but remains isolated next to the blue River. Restrooms are not the most desirable of facilities. Lees Summit Road will be under constructin for road widening beginning in 2011, but will minimally impact the trail usage. The Little Blue Trace is 12 miles long. The original planning map that is widely publicized shows only 10 miles, but changes were made in the final layout of the trail that were not included on the map. The mile markers are low, concrete slabs set in the adjacent grass borders, but they are easy to overlook. The southernmost .8 mile of the trail is concrete. 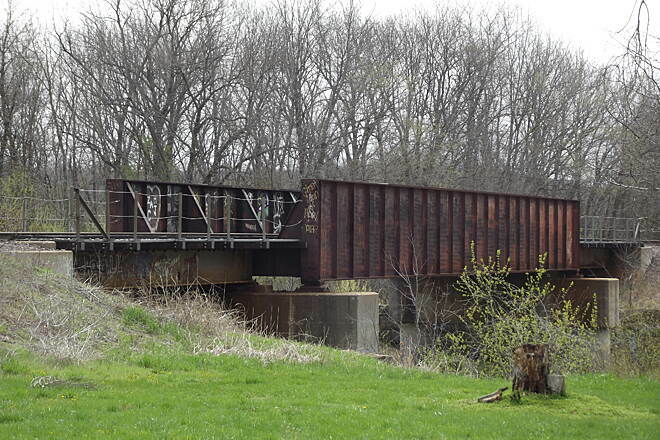 It runs behind the Hartman Heritage shopping area and ends abruptly at the I-70 bridge. 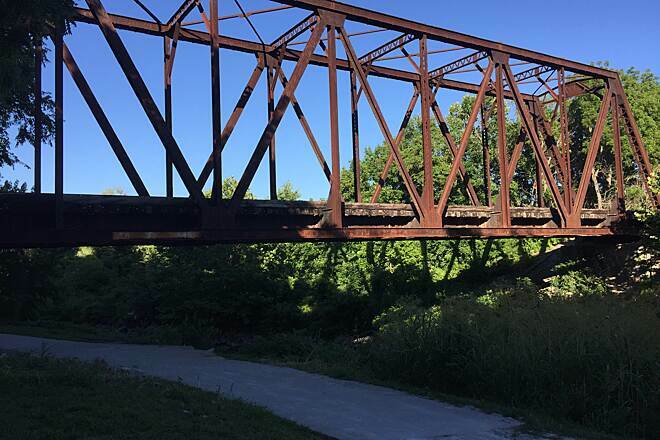 For history buffs, the trail will lead you under a 1900 railroad bridge (mile 11.1) that is still in use (by Kansas City Southern). 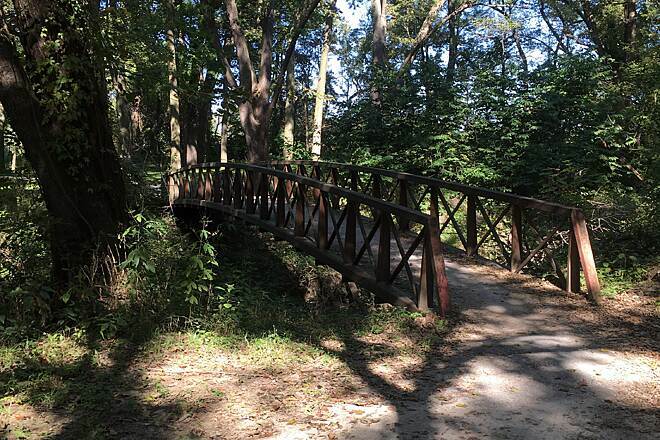 You'll also go under an abandoned railroad trestle (mile 3.7) that was originally part of a narrow gauge railroad built in 1878, and through a Civil War battlefield (Engagement at the Little Blue--part of the larger Battle of Westport), with a display map table, at mile 1.1. 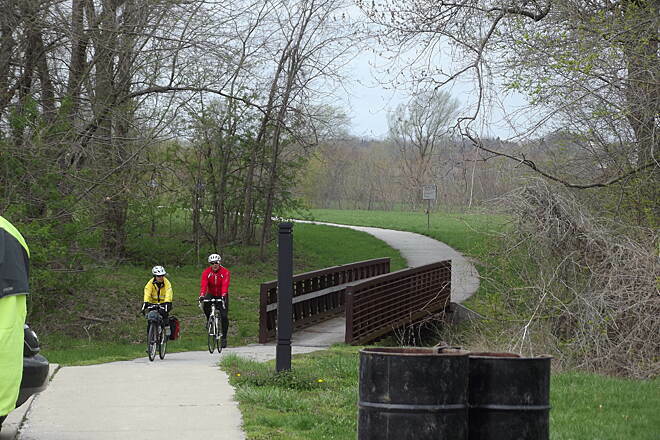 The trail takes you under Little Blue Expressway (mile 11.4), Pink Hill Road/39th Street (mile 10.9), R.D. Mize Road (mile 9.1), Truman Road (mile 6.2), Bundschu Road (mile 2.5), and U.S. Highway 24 (mile 1.1). 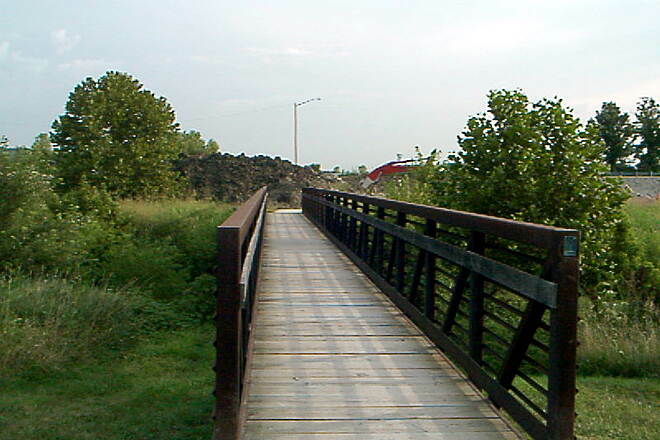 At M-78 Highway (mile 5.2) the trail leads you up onto the 4-lane roadway and bridge, which you must cross to reach the continuation of the trail on the other side. Fortunately M-78 doesn't carry much traffic, and there is good sight distance in both directions and a wide shoulder. At mile 1.1 the trail crosses an active railroad line (Union Pacific). Sight distance is good. 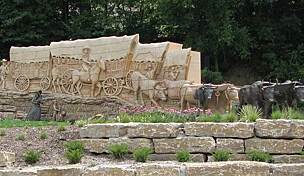 The trail gradually descends as you head northward. There are short, somewhat steep, ramps at the underpasses, and the trail has a few dips and slopes along the way. It is not quite as level as a rail trail. 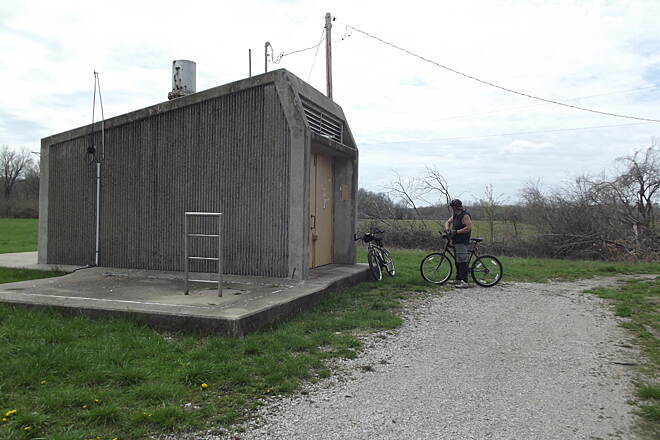 The only permanent restroom facility along the trail is at the M-78 shelter house, mile 4.9. There is no running water there, however. During the current season (2010), a port-a-potty is in place at the Hartman Heritage parking lot, mile 11.5. 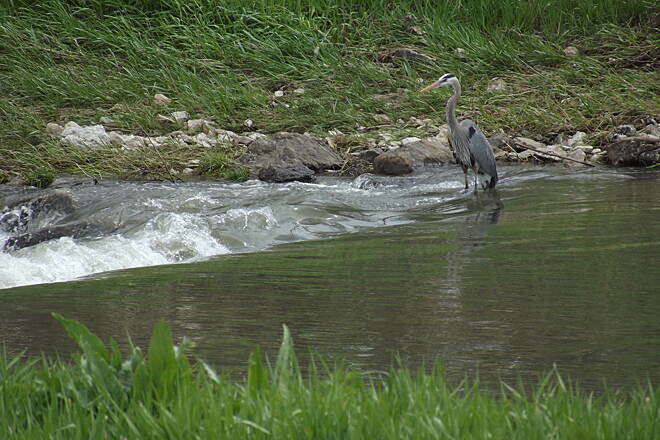 The trail is subject to flooding by the Little Blue River, and this is pretty much an annual event every June. The flood leaves mud deposits on certain sections of the trail. This mud becomes rutted by bicycle tires and hardens as it dries, leaving rough places that last all season. Also, in spots the gravel becomes rutted by heavy rains and stays that way for quite a while. The section from mile 3.5 to 4.5 is occasionally used by trucks that service water wellheads near the trail. This truck traffic can also leave deep ruts. The county does a good job of mowing the adjacent grass strips, but they are not so good at filling ruts. The trail offers a good deal of scenery, and you have the sense of being far from the city, even though you're not. You'll likely see a variety of wildlife--deer, rabbits, squirrels, turkeys, snakes, and birds of all kinds. (I haven't seen any skunks, but I've smelled them!) About 30 percent of the entire trail length is shaded. 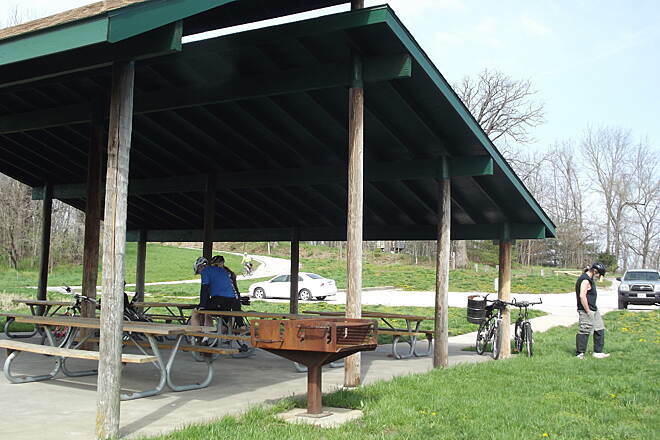 There are three shelter houses and three secluded picnic tables along the route. 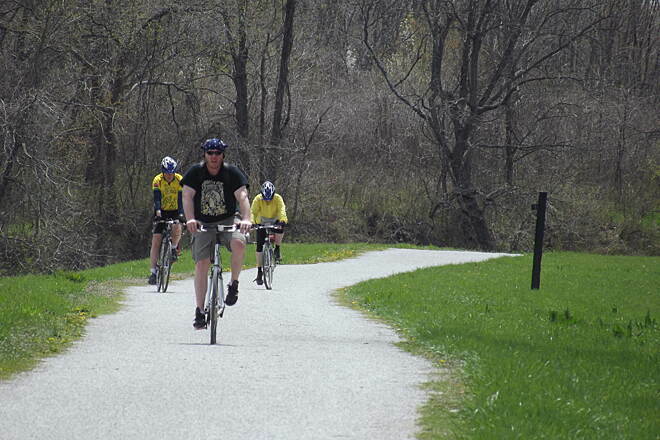 The trail will be lengthened an additional 3-1/2 miles southward over the next year. That will take it under I-70 and U.S. 40 Highway to Lee's Summit Road. Construction bids have gone out and work is scheduled to start in the fall of 2010. This was a great find for my family. We went only about 1/4 of the way but the scenery and trail itself were great. It really has no hills to speak of, we walked what we did and deffinetly would recommend it to anyone. 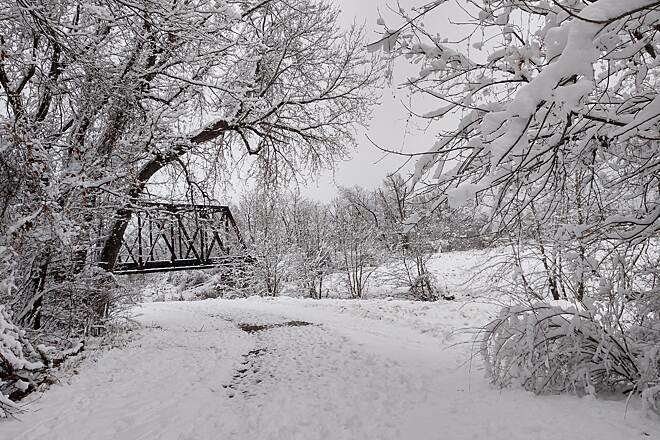 "I ride this trail 3 or 4 times a week. Currently the trail is about 10 miles one way. 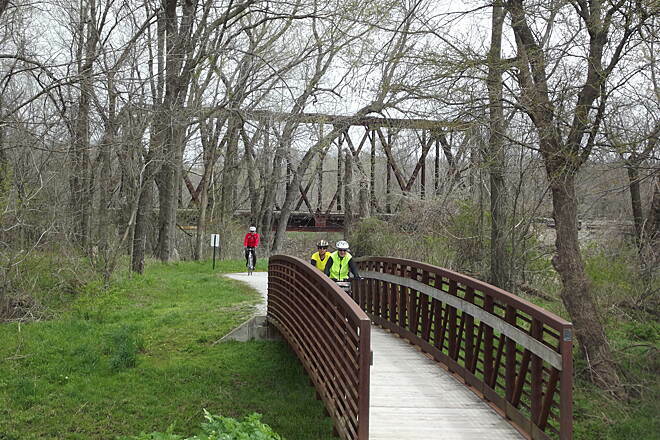 Part of the trail is blocked due to a new bridge being built at Highway 24. When this is complete then this will make available the final two miles on the north end to Blue Mills Road. 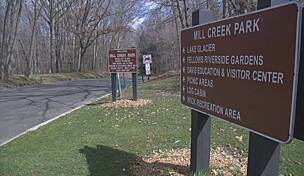 There is a parking area , just north of I -70 on Little Blue Parkway. This is just east of the Independence Shopping Center. Lots of scenic river views. Lots of wildlife. The trail also continues on the other side of Little Blue Parkway Rd. Its a one mile extention which is concrete paved. Stops at I-70 bridge at this time. Mostly flat but there are some small hills to climb. Easy. " "This is a nice relaxing trail to ride. Fairly flat and well maintained. 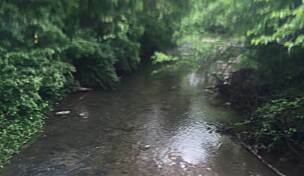 Runs right beside the little blue river , lots of nature to see." "The Blue Trace is now 10 miles long (and more to come soon we hope). 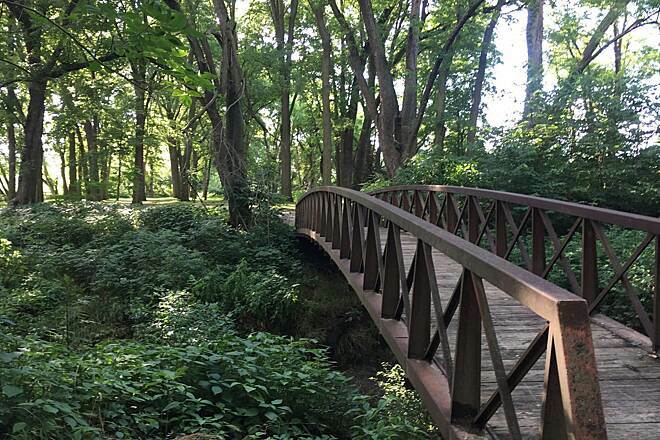 How lucky we are to have a giant slice of nature right in the middle of our city! Fairly consistent chad surface with a view of the river. On the south end of the trail, park across the street (Little Blue Parkway) from the new restuarants (Joe's Crab Shack, Hereford House, etc). Check it out!"